Standing up while that jingoistic song is played is endorsing pseudoscientific propagandist theories thoroughly debunked by linguistics. A refusal to honor the jingoistic song is standing up for civilized behavior and inclusiveness. Is Sri Vijayendra Sarasvati guilty? The Kanchi Mutt has explained that the seer treated it as a prayer song and remained seated in meditation. This is an event from November 2016 – see (35:00-37:00): https://www.youtube.com/watch?v=5TMhf1f2k34&feature=youtu.be. This is an event from October 2014 – see (14:00-17:00): https://www.youtube.com/watch?v=At83AC5ybaU&feature=youtu.be. 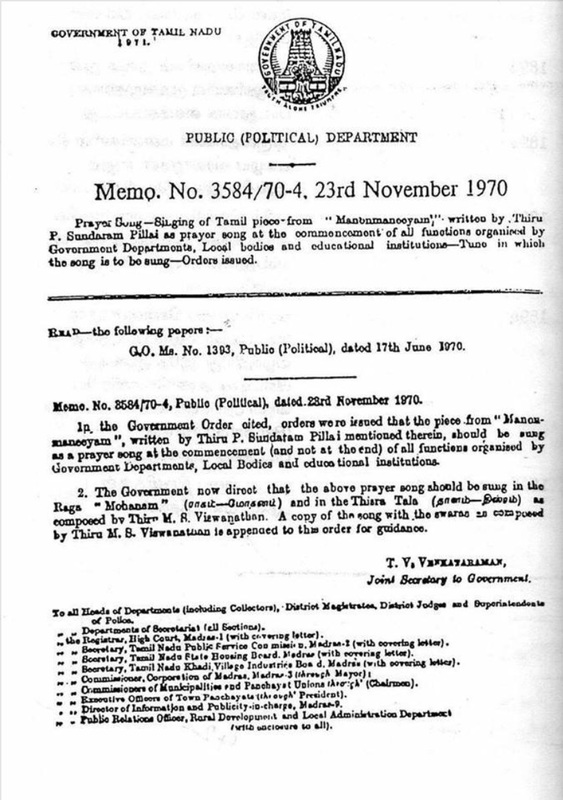 In a circular dated November 23, 1970, the Government of Tamilnadu designated the Tamil ‘anthem’ as “prayer song.” So, Sri Vijayendra Sarasvati is not wrong in according it the respect which the Kanchi seers have conventionally accorded prayer songs. Please see the circular below. One may note that there is no requirement to stand up while the Tamil ‘anthem’ is being played. In an event which the Kanchi seer attended on January 23, 2018, the Tamil scholar Solomon Pappaiyah had spoken about the close historical relationship between Sanskrit and Tamil. He highlighted the fact that Sanskrit and Tamil constitute two eyes of our culture. The Kanchi seer not only blessed and endorsed the speech but is also seen admiring it. Jataayu thus decisively refutes the charge that the Kanchi seer disrespected the Tamil ‘anthem,’ Tamil language, or Tamil culture. On the contrary, the seer accorded the Tamil ‘anthem’ the highest respect which he traditionally accords all prayer songs in Sanskrit or Tamil. The seer stood up for the national anthem because the law requires one to do so and it is not a prayer song. So, the conventions which the seers follow with prayer songs is inapplicable to the national anthem. As the scholar and writer Java Kumar has pointed out, the Kanchi seers have traditionally sung Tamil devotional songs with the utmost reverence. One may listen to the previous pontiff, Sri Chandrasekharendra Sarasvati sing the Tevaram here. So, the accusation that the seers are prejudiced against Tamil is false and perverse. (Tamil) you remain splendidly youthful – I admiringly salute! This is an ignorant, pseudoscientific, and jingoistic proclamation of linguistic supremacy. Contrary to the facts and linguistic evidence, four other Dravidian family of languages are portrayed as descendants of Tamil. These four languages didn’t originate from Tamil. As the eminent linguist Bhadriraju Krishnamurti explains in The Dravidian Languages, all these languages are cousins of Tamil and descended from proto-Dravidian. Some of them preserve linguistic fossils older than what Tamil has preserved. The ‘anthem’ addresses Sanskrit in derogatory terms. Besides, as Jataayu points out, while Sundaram Pillai was a renowned scholar in his early years, he had turned into a complete bigot in his later years and had embraced the racist theories of the fledgling Dravidianist movement. Arjun Sampath too points out in his recent interview that the ‘anthem’ fuels an anti-Brahmin and separatist mindset aimed at weakening India’s unity. A responsible society cannot bestow the status of anthem upon a song which embodies pseudoscience, jingoism, notions of race supremacy, and linguistic prejudice. That would be tantamount to sanctifying abhorrent worldviews in the eyes of impressionable children who’re mandated to sing prejudice-filled songs as anthem. Children have the right grow up embracing an inclusive worldview. So, Indians in general, and Tamils in particular, have a duty to reject the Tamil ‘anthem’ நீராருங் கடலுடுத்த with contempt. One may argue that my point is moot because the version adopted in Tamilnadu has left out these offending lines. However, that doesn’t redeem the song. One could always edit out a few offending lines from a Nazi song and sing it in public. However, no civilized person would even contemplate doing it. Tamilnadu has a great past and a refined culture. It cannot continue to honor songs which propagate divisiveness. It must be pointed out that many Nazi songs are noble and without prejudice. One such song is Erika. It was sung by the German soldiers in WWII. It expresses nostalgia for the home they had left behind to fight wars on foreign soils. However, its lyrical and musical appeal notwithstanding, the song is not sung anymore, because it was composed by the Nazi Herms Niel. Likewise, a song written by a racist should be shunned – its otherwise lyrical beauty notwithstanding. Besides, unlike Erika, the original version of நீராருங் கடலுடுத்த is filled with prejudices. A society should aspire for higher ideals and not sanctify songs which propagate prejudices. Children are curious but not always discerning. Even if we give them the sanitized version of a song, we should anticipate that they would explore and find out the suppressed lines. Since they’ve been taught to venerate the ‘anthem,’ they may not always discern that the suppressed lines are filled with prejudice. 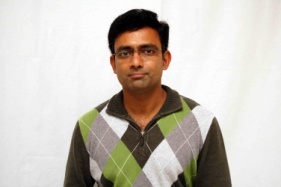 There is a real risk that they may be carried away by the divisive rhetoric of Sundaram Pillai. German children were turned into Hitler’s Willing Executioners through such divisive songs written by the likes of Julius Streicher. So, only the works of deserving role models should be declared anthems or even prescribed reading for children. It has been objected that even India’s national anthem, written by Rabindranath Tagore, allegedly eulogizes the Prince of Wales, and that Tagore also opposed the revolutionary freedom fighters. It is a valid objection. I think there is a strong case to replace Jana Gana Mana with Vande Mataram. Those who denounced our revolutionary freedom fighters cannot be our role models. However, Tagore’s song is not divisive, prejudice-filled, or racist. Arjun Sampath, in the aforementioned interview, points out that நீராருங் கடலுடுத்த was only declared the Tamil ‘anthem’ in 1970. Before that, the patriotic song written by Subramania Bharati, “வாழிய செந்தமிழ்! வாழிய நற்றமிழர்! வாழிய பாரத மணித்திருநாடு!” was the de facto Tamil anthem. It was sung in schools and public functions. It inculcated healthy patriotism and love for the Tamil language and Tamil heritage. In 1970, during the heyday of Dravidianist politics, this ennobling song was displaced by the controversial நீராருங் கடலுடுத்த. Sampath has aptly stated that if elected to power he would undo this mistake. An online editorial from a portal sympathetic to Hinduism denounces the Kanchi seer and accuses him of disrespecting the Tamil ‘anthem.’ It contemptuously urges him to stand up and be counted. I presume that the editorial team wasn’t aware of the offending lines of the original version of the song I have cited above. They should realize that standing up while that jingoistic song is played is showing disrespect to at least four other Dravidian family of languages as well as to Sanskrit. Standing up while that jingoistic song is played is endorsing pseudoscientific propagandist theories thoroughly debunked by linguistics. A refusal to honor the jingoistic song is standing up for civilized behavior and inclusiveness. Such a refusal is an endorsement of scientific understanding of evolution of languages. I hope that Hindus do not indulge in knee-jerk reactions and dhimmitude and instead understand the issues in-depth. Sri Vijayendra Sarasvati, who sat in meditation and thus treated the ‘anthem’ with respect, is unlikely to be aware of the prejudices it embodies. I hope that in the future Hindu leaders would mandate that the offending ‘anthem’ not be sung, and instead, Bharati’s “வாழிய செந்தமிழ்! வாழிய நற்றமிழர்! வாழிய பாரத மணித்திருநாடு!” is sung, in the functions they attend. In this controversy, Sri Vijayendra Sarasvati’s error is that he accorded the prejudice-filled ‘anthem’ undue respect by sitting in meditation while it was played.